In the July 2013 issue of FEBS Letters, Tohru Natsume’s group from Tokyo published their recent research into human LARP1 (Aoki et al FEBS let. 2013). They showed that LARP1 regulates the stability of 5’ terminal oligo-pyrimidine (5’TOP)-bearing mRNAs by interacting with the 3’ terminus of their poly-A tails. To reach these conclusions the authors first constructed a chimeric mRNA bait to use for immunoprecipitation. This was comprised of a poly-A tail, beta actin 3’UTR, a 5’Cap and a tag complementary to a LNA oligonucleotide conjugated to a FLAG peptide. LARP1 was one of the RNA-binding proteins to be precipitated using this bait, identified by mass spectrometry. The authors then validated these findings by performing LARP1 immunoprecipitation using: the entire chimeric mRNA bait with a Cap and 60 nucleotide poly A tail (Cap-A60), the bait with no 5’Cap but the poly A tail (A60), the bait with no cap and an extra 35 nucleotide sequence after the poly A tail at its 3’ end (A60+Ex) or a combination of both (Cap-A60 & Cap-A60+EX). They showed that LARP1 was bound only to the chimeras with the poly-A tail with or without the 5’cap (Cap-A60 or A60), but did not bind chimeras bearing the 3′-extra sequence (A60-Ex, CAP-A60-EX), regardless of the presence of the 5’ cap. They concluded that LARP1 bound to the poly-A tail of the chimera and, although the presence of a 5’Cap did not abolish the interaction, it was disrupted by the presence of an extended sequence at the 3’end. They then demonstrated that the minimum poly-A tail length for LARP1 binding was 9 adenosines. However, this binding was nucleotide-specific. When the 9 adenosines were replaced with 9 cytidines (poly-C), 9 guanosines (poly-G), 9 uradines (poly-U) or the addition of a single C, G or U at the end of the 9 nucleotide long poly-A tail, LARP1 binding was disrupted, indicating a high specificity of LARP1 to poly-A binding. This finding contradicts that of Nykamp et al who found C.elegans LARP1 preferentially bound poly-C and -U, with no binding to poly-A and -G.
Aoki and team then reinforced their hypothesis by demonstrating an enrichment of polyadenylated mRNA and absence of mRNA species lacking a poly-A tail (such as histone mRNA and rRNA), in LARP1-RNA complexes immuno-precipitated from HEK293 cells. LARP1 interaction with PABP1 has been reported in previous work using Drosophila LARP1 (Blagden 2009), human LARP1 (Burrows 2010) and in the yeast LARP1-orthologue SLF1 (Richardson 2012). In these publications, the authors concluded that the interaction was RNA-independent as it was conserved after enzymatic RNA digestion. In the Burrows and Richardson papers RNAse A was used, which preferentially degrades pyrimidine nucleosides (C and U) but would have left the poly A tail intact. Blagden et al showed the dLARP1-PABP interaction was maintained after RNAse I digestion, an RNAse that cleaves all four nucleotide bases (A,G,C&U) including a poly A sequence. In contrast, Aoki and team showed that RNAse I treatment disrupted the interaction between LARP1 and PABP, suggesting it was in fact RNA-dependent. They suggested that this discrepancy was due to poor conservation of the LARP1 N-terminus during evolution. However, as the site of interaction between LARP1 and PABP is not known, and there are such conflicting findings as to the nature of this interaction, it would have been interesting if they had tested the PABP/LARP1 interaction using the entire panel of RNases to more conclusively define the conditions dictating it. As LARP1 was demonstrated to co-immunoprecipitate with the poly-A tail of their chimera, the authors hypothesized a role for LARP1 in mRNA stability. They observed that LARP1 knockdown reduced the stability of mature mRNAs carrying a 5’ terminal oligo-pyrimidine sequence (5’TOP) but did not affect the stability of their corresponding pre-mRNAs. They observed no effect on non 5’TOP-bearing mRNAs. 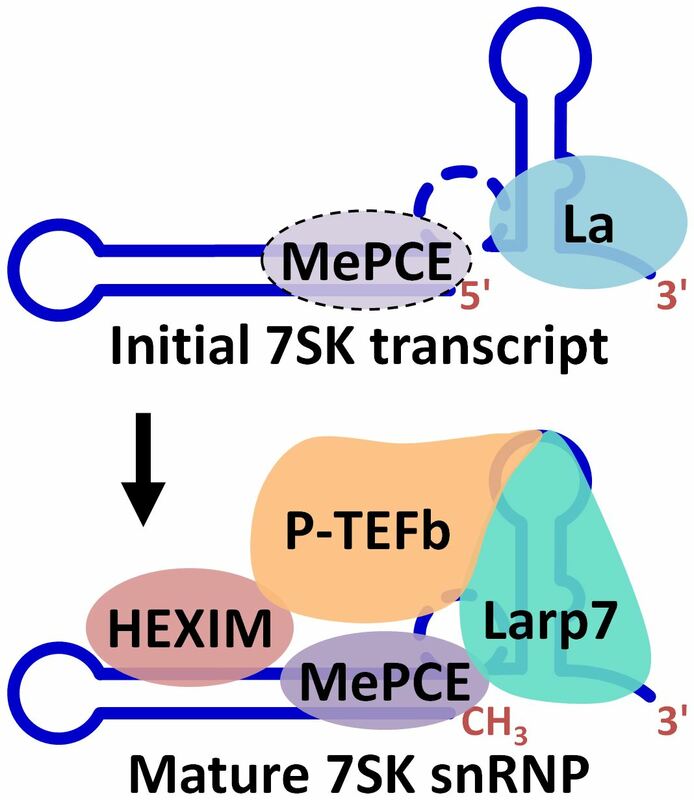 The authors therefore hypothesized that LARP1 stabilizes 5`TOP mRNAs by bridging the 5’Cap of 5’TOP mRNA to the poly-A tail. As TOP genes encode ribosomal proteins and translation-related proteins as well as those involved in lysosome-related signaling and metabolism, these findings firmly place LARP1 as a regulator of mRNA translation. The question that remains unanswered is how LARP1 selects 5’TOPs as its mRNA targets. Regulatory elements recognized by RNA-binding proteins (like LARP1) can be complex and most likely involve multiple binding sites and interactions with other RNA-binding proteins, regulatory proteins or microRNAs. 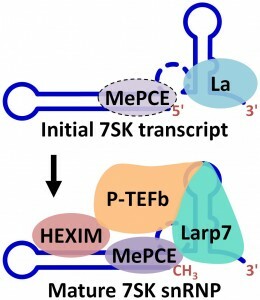 It is possible that this elusive recognition mechanism is not confined to LARP1 but is shared by other members of the LARP family of proteins, and perhaps other RNA-binding proteins. Although Aoki and team have shed some light on the site of interaction between LARP1 and its targets, the authors have not identified sequences or structures carried by 5’TOP-bearing mRNAs that confer LARP1 recognition. Nevertheless their findings of an important new mechanism for LARP1 in translation control are interesting and invite further research. Collagens are the most abundant proteins in the human body, they are homo or heterotrimeric protein complexes that form higher order structures such as fibrils and networks in the extracellular matrix. They as such, play crucial roles in maintenance of animal tissues integrity and remodeling during growth, differentiation as well as wound healing. Vertebrates have at least 27 collagen types and several thousand mutations in collagen subunit coding genes have been reported that are linked to human diseases (for a review see Myllyharju J. and Kivirikko KI., (2004) Trends in Genet, 20:33-43 and references therein). Type I collagen structural disorders cause Osteogenesis Imperfecta (an inherited bone fragility disorder) ( http://www.le.ac.uk/ge/collagen/ ), while up-regulated deposition of type I collagen is the hallmark of fibroproliferative disorders of highly deleterious impact to the human health. Over the past years, work conducted by B.Stefanovic and collaborators (Florida State University, Tallahasee, USA) identified the human LARP6 protein as a regulatory switch to type I collagen production. Through a serie of four articles, B.Stefanovic and coll. not only provide a first model of the translational regulation of type I collagen production but also emphasises the importance of HsLARP6 function in human health (Cai L. et al (2010a,b); Challa A. and Stefanovic B. (2011), Manojlovic Z. and Stefanovic B. (2011)).